Overtime, with aging, volume is lost in the face resulting in a sunken or gaunt appearance. If you have considered undergoing a facial rejuvenation procedure but don’t think you’re ready for a face lift or other form of facial cosmetic surgery, Fat transfer injections could be the answer. By adding volume to the face with fat grafting, fullness is restored leaving patients looking more youthful and refreshed. There is also some evidence to suggest that fat grafting may actually improve the quality of the overlying skin. In today’s cosmetic world, fat grafting not only addresses one’s facial and body proportions, but can also improve the surrounding tissues. This injection method of facial fat sculpting, also called microlipoinjection, can restore attractive contours to your cheeks, chin, and under-eye area, and add volume to your lips. There are three different types of fat grafting techniques that can be used to transfer fat around your body. Each one has its own use and benefits. Nano Stem Serum: This is when a fat serum has been spun down in a centrifuge to a high concentration of stem cells. This serum of stem cells is used to improve the overlying skin’s appearance, texture, and quality. The effect is not immediate, but progressive, occurring over a 2 months’ period. A fat transfer procedure can usually be performed as an outpatient procedure at the cosmetic center of your surgeon. The fat transfer procedure begins with liposuction to remove some excess fat from the donor site, which could be the abdomen, buttocks, hips, "saddle bags," thighs, or even jowls. In order to collect as many undamaged fat cells as possible, only very-low-suction liposuction is used. These fat cells are removed from the donor site with a small-gauge hypodermic needle or a special cannula that is designed to limit damage to the fat cells. 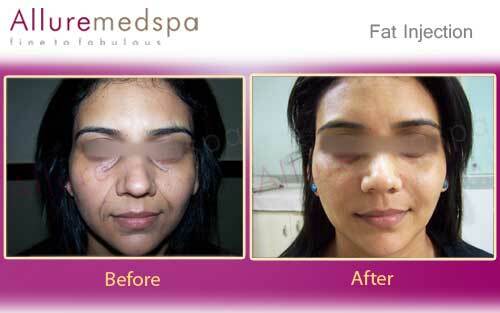 The fat transfer procedure is completed by injecting the fat cells into the target site(s) on your face. At this point, your doctor will have already identified the site for each fat injection, with the intent to correct imperfections or create a new contour. U sing a separate hypodermic syringe, the doctor will inject the fat cells at the depth needed to achieve the desired fat transfer results. The results of a fat grafting procedure can vary widely among individual surgeons. The subtleties of a surgeon’s techniques and skills can affect the outcome of a patient’s procedure. This means when looking to receive this injection technique, you should work with an experienced surgeon. 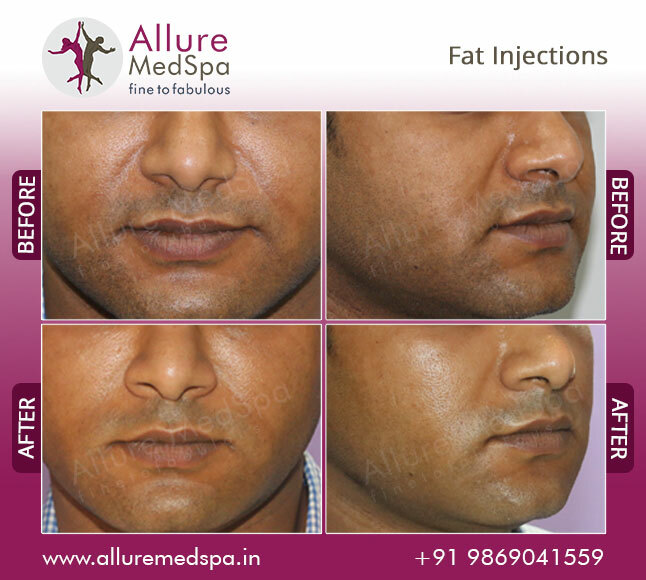 Dr. Milan Doshi at Allure MedSpa who specializes in fat grafting, has performed this technique a numerous amount of times and has produced high quality results. A fat transfer procedure is usually done with local anesthesia only, not general anesthesia that would put the patient to sleep. The type and amount of anesthesia depend in part on the amount of liposuction and fat transfer you require, which will be determined by your doctor. Once your fat transfer is complete, you may have some slight swelling and/or bruising at the donor site or the target site(s) on your face. The swelling can be expected to go away in a few days, and any discomfort you feel can be controlled with medication to pain. As with all medical procedures, you should follow all postoperative instructions from your cosmetic surgeon or dermatologist. Many patients return to their normal daily activities within hours or a day or two of the fat transfer procedure. Allure MedSpa which is renowned for its state-of-the-art internationally acclaimed services, value for your money with cosmetic procedures. To know more about the cost of your procedure request a consult by filling the form below. Your consultation is your chance to ask questions about Hair Transplant and put your mind at rest. Your surgeon will be able to offer you full explanations and answers to all of your queries. A good candidate is any patient who suffers from facial volume loss and desires correction. It’s important the patient has good health and realistic expectations regarding their outcome. Short term discomfort might be there after the Fat transfer. Keeping head elevated and following the doctor’s instructions will help in a faster recovery. Allure Med Spa’s clientele comprises of local, out-of-town patients. A good percentage of patients also ‘fly-in’ from out of the country to have surgery with our renowned surgeons. Please feel free to contact the Counsellor Book a counceling session for assistance with any of your travel and planning needs. 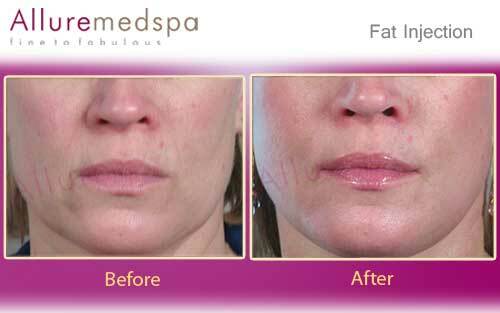 You can expect fat transfer results that are immediately apparent or that will be clear after any swelling has receded. A significant benefit of this technique is that the results generally last much longer than the results of other dermal fillers. Individual fat transfer results definitely vary, but with a properly performed procedure, the results may last for years, or even permanently. Fat injections, which transfer the patient’s own tissue from an area of excess to an area in need of filling, have at least one major benefit over artificial dermal fillers: they have no chance of causing an allergic reaction. Anytime a substance from another organism is introduced into the body, which may perceive the material as a threat. Fat transfers avoid this problem, since the body will recognize the tissue at its own, even in its new location. What areas of the body is fat typically harvested from? 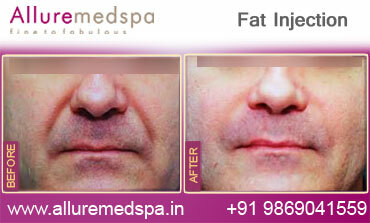 One of the benefits of fat transfer is that it can address two problems at once. 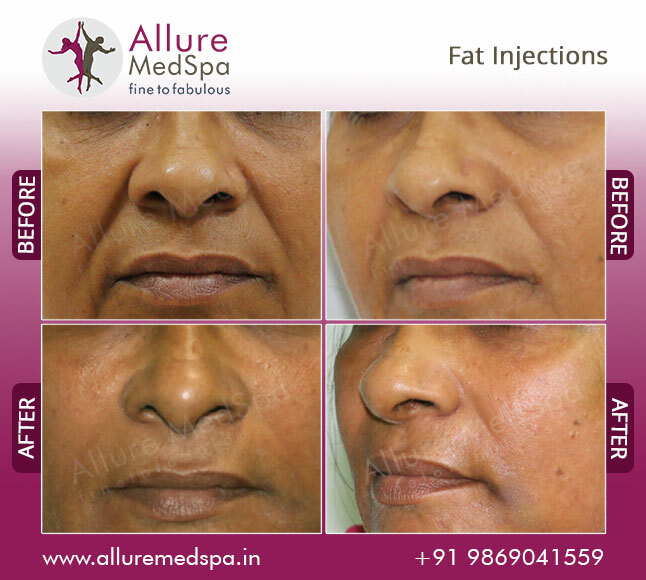 The fat for the injections may be taken from any spot on the body that contains a concentration of excess fatty tissue. The patient and the doctor will work together to decide which areas of the body are eligible, and which the patient would most like to see reduced. The pain from fat grafting should be minimal in almost all cases. Discomfort should be only short term and usually can be managed with oral pain medication. If you are concerned about the pain, you may discuss options for prescription medication to be taken after the fat injections. 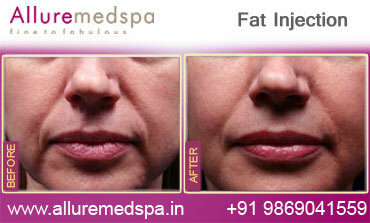 Are multiple fat injections needed to achieve desired results? Though it depends on the extent of change the patient desires, multiple fat transfer injections are very often recommended by the cosmetic surgeon performing the procedure. Splitting the procedure up into multiple installments allows for more tissue to be transferred with less damage to both the donor and injection sites. Your doctor can go over the pros and cons of various treatment options with you in detail. Patients must understand that the results of fat injection procedure are not everlasting. Result may last for years, if you don’t loss much weight. Cosmetic surgery procedures, such as a facelift, will provide a longer lasting result than non-surgical procedures like fat injections. Fat injections are a solution to those who want a quick, easy procedure, with a minimal amount of downtime. Are there any risks with Fat injection? Fortunately, significant complications from Fat injection infrequent. Every year, many people have Fat injection for facial feature correction, experience no major problems and are delighted with the results. Anyone considering Fat injection, however, should be aware of both the benefits and the risks. Your surgeon will discuss these with you during your consultation. What happens after Fat injection? 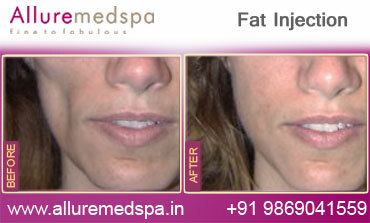 Generally, swelling around the treated area is most apparent during the first few days following Fat injection. It will disappear within a week. A few days after Fat injection, you can begin to wear make-up. If minor swelling in treated area is not an issue for you, you can resume work immediately. 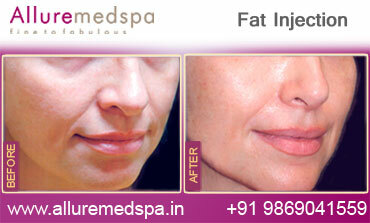 The aim of Fat injection is to looks natural, harmoniously facial features and enhances your self-image. Since the healing process is gradual, you should expect to wait to see the final results. You are likely, however, to begin enjoying your new look fairly soon after Fat injection. Can I expect aftercare following Fat injection surgery? Allure medspa takes special pride in offering our patients excellent levels of post-operative support. Once your Fat injection is complete, we’ll monitor your progress through calls and follow up visit, if required. How much does Fat injection cost? 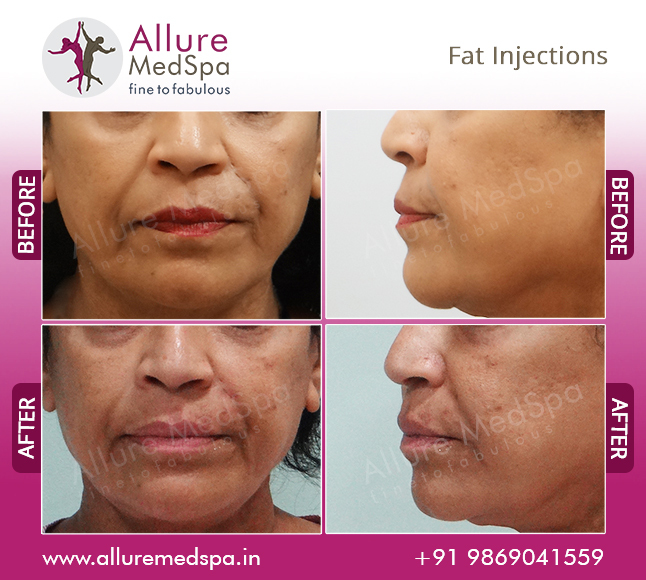 For an estimate on how much a Fat injection may cost, we recommend that you call Allure medspa on +91 9869041559 for our latest Fat injection prices. For specific information based on your individual needs, we will be happy to arrange a consultation.